You can order the STAM courses Online or Offline for Single User. Please select the Multi User option if you wish to setup a corporate account or register multiple students. Select the course and enter the student details. Please make a note of your User Name and Password. Fill the card details and click Submit. The payment will be processed by Verisign Payment system. You can start the course immediately by logging in (See Logon link in the LHS panel) and clicking the course link under My Courses. Print the order from and mail or fax it to STAM for processing. Click Here to Download Order Form. STAM will process order and email the user link. Note: If you purchase multiple courses, the license duration for each course will commence only when you start the online course for the first time. 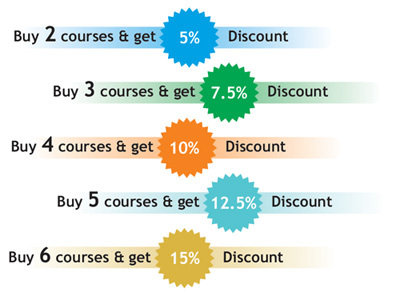 This way you can avail of the discount structure by purchasing multiple courses. In the online order form this discount is calculated automatically.